If you’re like me, the gas grill has a permanent position just outside the door on the deck. For at least 3 seasons of the year, if I get the urge for a quick bratwurst for lunch or a steak for supper, my trusty propane-powered cook station is at the ready to satisfy my need for charbroiled meat. Though I prefer the flavor of a true charcoal barbecue, the convenience of turning the knob and pushing the piezo electric igniter better suits our last-minute “Let’s do shrimp on the barbi” lifestyle. Following are the best grilling tips to make you a grill master at home. Becoming “master of your grill” includes more than simply being able to light the burner. There are some tricks of the trade worth learning — such as how to cook different meats, how marinades and seasonings compliment and tenderize certain cuts of meat, and how to tell when something is cooked to perfection. “Low and slow” is the key to making even the toughest cut of meat tender enough that you can pull it apart with a fork. All it takes is low heat and some time; lots and lots of time. Here are 9 affordable steaks that are well-suited for grilling. There’s no need to spend top dollar every time you want beef for supper! 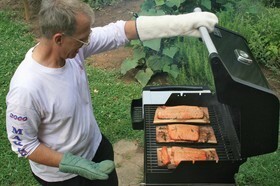 Always keep safety first as your primary concern when using a grill. Both gas and charcoal grills can quickly get out of control and place people and structures in extreme danger! Never attempt to light a grill that is located in a building such as a garage or under a covered porch or deck. And finally, if you haven’t already given some thought to greener grilling techniques, let this be the year to “think green” when you’re planning your next backyard BBQ. There are many things you can do to conserve resources when you’re grilling. For starters, recycle all paper, plastic, and aluminum products. And something most people wouldn’t think of… use pitchers of iced tap water in place of individually bottle water. No one likes replacing home appliances every couple years. The same is true with an outdoor grill as well. After all, it will see plenty of use through its lifetime. Buying a grill that is designed to give good service for many years means that you will spend less money in the long run. Stainless steel construction – takes rust out of the equation. 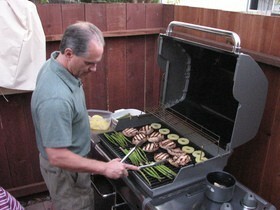 Burners with long warranties – to keep the flames hot (burners are often the first item to fail on a gas grill). Cast iron rather than a chrome-plated wire cooking surface – just as cast iron frying pans are indestructible, your grill will last much longer and be easier to clean. Check out The Best BBQ Values to see the grills that rated highest on performance and construction quality, according to Consumer Reports and Good Housekeeping. I find it interesting that they didn’t feel the latest infrared technology was any better than a standard gas grill. Keep that in mind, if you’re the type that usually likes all the latest bells and whistles. If you’re trying to grill greener this year, these 6 BBQ grill facts will help you decide which is the best grill for you. Bobby Flay’s 10 Great Grill Tips – use squeeze bottles! Green Grilling – which grill is best? 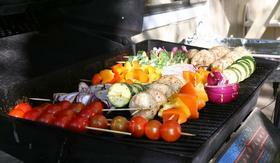 How To Upgrade Your Grilling Experience – tongs, tongs, tongs! Grill Cleaning Tips – how to clean your grill like the pros do!